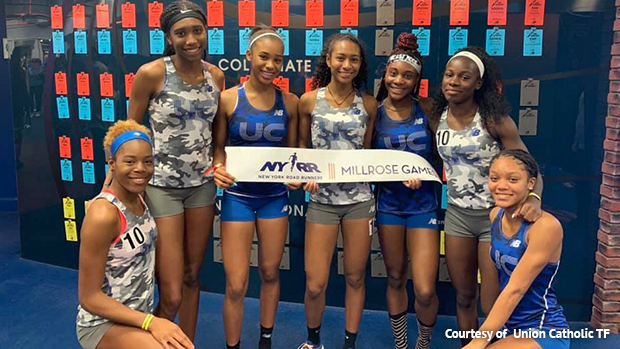 Several of New Jersey's biggest stars shined brightly on the big stage at Saturday's 112th Millrose Games at the New York City Armory. Athing Mu of the Trenton Track Club continued her magical season by nearly breaking the national record in the girls 600-meter run. US leader Luis Peralta of Passaic won the boys 600 in come from behind fashion. St. Benedict's Prep tore apart the boys 4x800 with one of the fastest times in NJ history, and the Union Catholic girls won a pair of relays. Mu, the remarkable junior, blitzed the field in the 600 with a red hot winning time of 1:27.36., just off the national record of 1:27.13 set in 2017 by Sammy Watson. Junior Victoria Vanriele of Gov. Livingston placed second in 1:30.64. In the boys 4x800, St. Benedict's Prep ran away with the race and dropped a US#1 7:43.68, which is No. 3 in NJ indoor history. St. Peter's Prep placed fifth in a NJ#2/US#6 7:54.40 and Ridge was sixth in a NJ#3/US#7 7:55.16. St. Benedict's, which won the race by more than nine seconds over Loudoun Valley of Va. (7:52.78), received splits of 1:55.28 from Jackson Burnett, 1:56.47 from Lewis Ngwenya, 1:58.33 from Ronald Kigen, and 1:53.61 from Alfred Chawonza. Only CBA (7:41.53) and Cherokee (7:43.64 in 2012) have run faster indoors than St. Benedict's. In the boys 600, Oregon-bound Peralta had to rally over the final 200 to win in 1:19.29, just off his US#1 and NJ#3 all-time 1:19.14. Peralta edged Chawonza of St. Benedict's, who took second in a US#2 and NJ#4 all-time 1:19.61. Chawonza ran that 600 about an hour after his 1:53.61 anchor. The Union Catholic girls, despite not having its regular lineup in either race, still swept the girls 4x400 and 4x800 relays in dramatic fashion. In the 4x800, UC threw down a US#1 and NJ#8 all-time 9:07.44, just ahead of Mt. De Sales of Maryland, second in a US#2 9:07.87. UC anchor Leena Morant went to the lead at the bell on her way to a 2:11.28 anchor split as she held off Juliette Whittaker of Mt. De Sales, who split 2:08.96. Union Catholic's first three legs on the 4x800 were handled by Morgan Williams (2:18.06), Jerika Lufrano (2:16.47), and Ashleigh Patterson (2:21.63). UC, the state leader in the 4x400 at 3:50.93, came back later to run 3:53:53.40 and rally to finish first in the Suburban Division 4x400, edging Rancocas Valley, second in a NJ#2 3:53.97. Millville was third in a NJ# 3:55.04., and Ramapo sixth in a NJ#4 3:58.20. UC's 4x400 lineup consisted of Avery Jordan (59.83), Sydney Tucker (57.88), Zamira Ysaac (58.90) and Chidumga Nkulume (56.81). Nkulume got the baton in the third place, but didn't stay threre for long as she overtook both Rancocas Valley and Millville to secure the win for the Vikings. In other NJ highlights, Villanova-bound Sean Dolan of Hopewell Valley finished third in the boys mile in a NJ#4 all-time 4:09.55, Tim McInerney of CBA placed 10th in 4:16.68, and William Baginski of Ridgewood was 12th in 4:17.49. Christian Brothers Academy won the boys Independent Division 4x400 in a NJ#2 3:23.14, the fourth fastest time in school history, and Pope John captured the girls Independent Division 4x400 in 4:06.33. In the girls 60 dash, Kayce Darby of Teaneck finished third in 7.77 and Grace O'Shea of Ramapo, the state's top hurdler this season, placed fifth in 7.92. In a battle between the state's top two pole vaulters, Bradley Jelmert of Watchung Hills cleared an NJ#2 15-5 to place third. Liam Landau of Pascack Valley, the state leader at 15-9, cleared 14-11 to finsh fifth. Freshman Camryn Wennersten of Ridgewood finished 10th in the girls mile in a NJ#3 4:56.59.